Recorded in the Domesday book of 1086 as Celmeresfort, which had changed to Chelmsford by 1189. Ten years later, in 1199, the commissioning of a bridge over the River Can marked the origins of the modern town (recently granted city status). At the same time a royal charter was granted for a market to be held between Tuesday and Saturday. 800 years later and the market is still an important part of the city centre. Interestingly, Chelmsford was the seat of Government for six days during the summer of 1381. And one last fact... The first entertainment radio broadcast was made from Chelmsford on 15 June 1920. 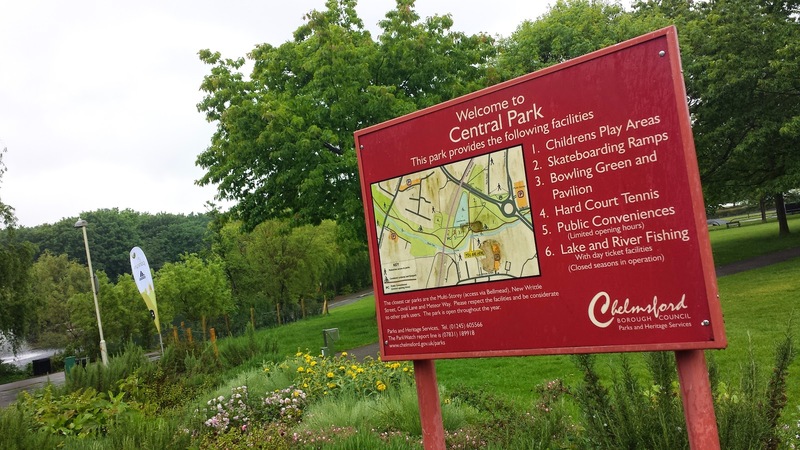 The name of this parkrun gives you an idea of where it is located, and it is indeed very central. 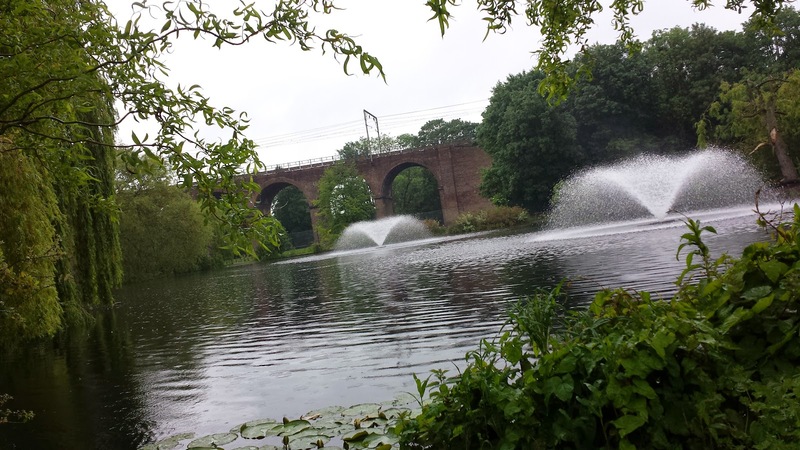 Travelling here by train to Chelmsford Station leaves any visitors with just a short walk to reach Central Park. For anyone travelling by car, there are a number of pay and display car parks close by. I managed to squeeze myself in next to the miniature railway just off Meteor Way - I'm not sure if I was technically allowed to park there, but I did. Most of the locals seemed to arrive on foot. I looked for some bicycle racks but couldn't find any in Central Park - the cyclists seemed to use the wooden fence adjacent to the river path. The main part of Central Park is incredibly small (it felt more like a garden than a park) so you can't really miss the 300+ people in a multitude of fluorescent shades gathering near the start area. The run takes place on an almost-completely-flat course and is suitable for buggy runners. It's an out and back course with a large loop at the far end - the official course page describes it as a one lap course, but you would be forgiven (I hope) for referring to it as the former. It is mostly tarmac but features approx 1 kilometre on grass. 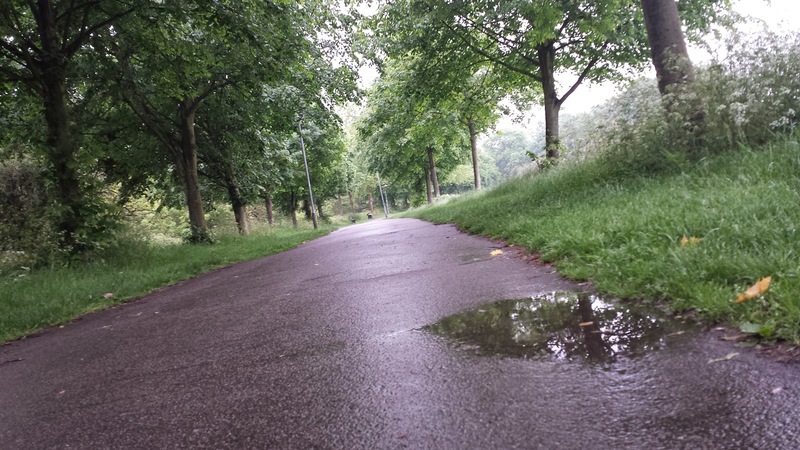 I ran here on a rainy morning so popped on my trail shoes to be on the safe side. Before the run, I managed to find shelter in the toilets, which are just behind the cafe. I joined the first time parkrunners for their special briefing, which took place a few minutes before the full full briefing. Once the run is underway, the runners follow a loop of the tree lined paths around the formal section of the park before running along the edge of the lake where they may spot one of its resident swans. 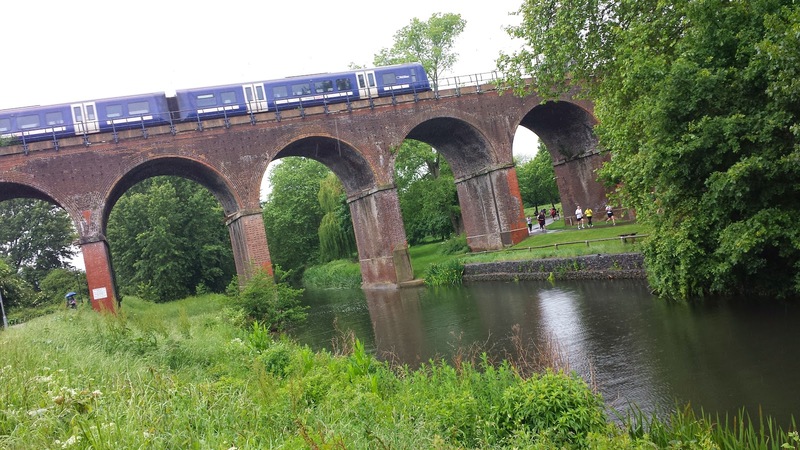 They then head through one of the 18 arches of the Victorian railway viaduct that carries the main Great Eastern mainline services through (or over) the park. A real big plus point for this venue was the inclusion of kilometre markers around the course - very few parkruns do this, so I wanted to praise the organisers for going the extra mile (or kilometre). 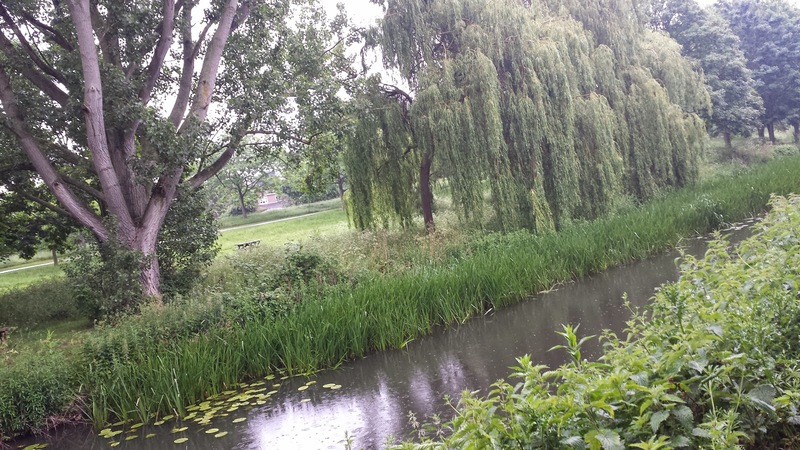 ... Chelmsford Central parkrun doesn't just give you one park to enjoy. Here, the runners have the pleasure of sampling two of the city's parks. So as the runners emerge from the subway, they enter Admirals Park. Shortly after this they pass over a narrow bridge. A little further on they leave the river path and turn left to complete a lap of the north west end of the park. 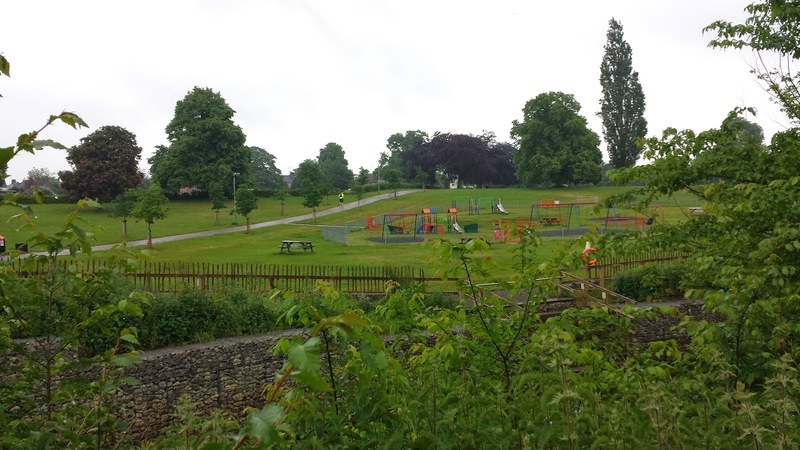 This park features a children's playground, tennis courts, football and cricket pitches as well as natural spaces that encourage wildlife. It is also home to Chelmsford Bowls Club. At first the path is tarmac, but after crossing another bridge, the runners take to the grass for almost the next kilometre - the grass section is broken by a brief return to the tarmac path where runners have to negotiate a small incline. They then return to the grass to run a lap of the football pitches and then back past the children's playground. In the dry months it'll be fine for road shoes, but when it's wet, runners might find trail shoes come in handy during these grassy (and potentially muddy) sections. After completing the clockwise circuit of Admirals Park, the runners head back along the riverside path and follow it all the way back to Central Park. Just before reaching the viaduct the runners stay to the right and follow the path closest to the river, passing through another of the 18 arches before running another loop of the tree lined paths. Now at the end of the 5 kilometre run, the runners enter the finish funnel on the grass near the lake and collect their finish token. 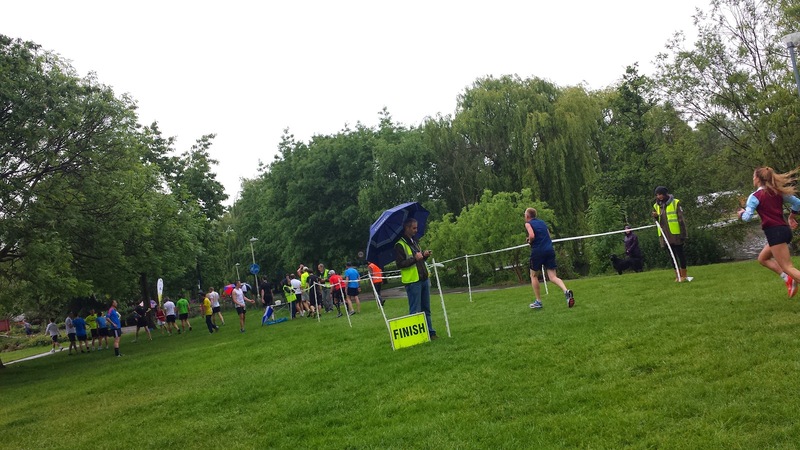 Scanning takes place on the grass (head for the gazebo if it's there) near the finish line, and once done, runners are free to continue their day or head to the 'Cake on the Lake' cafe for a bit of post-run socialising with the other runners and volunteers. 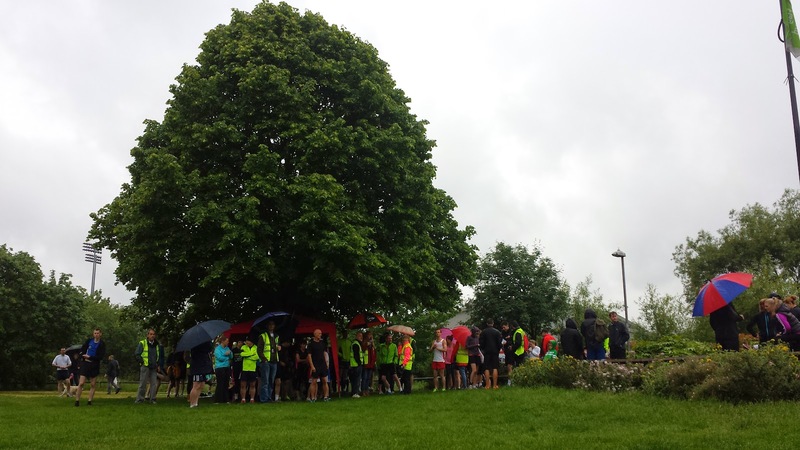 I ran at event 71 where 281 runners turned up - I imagine the rain put some people off. Anyway, it is a fast course and the surroundings are very pleasant. I only wish I could have stayed for a quick cup of tea, but I had to get over to Ebbsfleet International in order to catch a train to Aachen for my first international race.